Last edited by StylesFactoryPL on Thu Aug 09, 2018 2:02 pm, edited 4 times in total. looks good but the banner images are not responsive. when you reduce the screen size, they don't change to fit. This is all in beta. I need feeback from phpbb community to make those themes fit perfect I am making updates of core elements of the theme each day. I really like like this style. Thinking of using it on my forum. After installation I noticed that quotes were white on white background. Wow I really like this style. Cant wait for the final result. 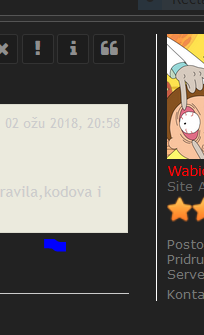 How do you put icons next to the forum. Thank you Im new in phpbb. https://imgur.com/Uw5ZxlF Check this. Icons are little broken if they forum description is a little bigger. Can you show me your live forum? Send it here or on pm. First, good job, your style is very beautiful and I like it. I saw that you going to make a World of Warcraft version for it ? Do you have an ETA for this version ? Do you will make an "Alliance" version :p ? Thanks for your answers and like I said, nice job ! I am preparing White version for ClanZ and most releases will be made before 1st of april. All before 1st april. Next gfx will be deployed in next months. Sorry for delay. New update for ClanZ dark is up now. Just download it from stylesfactory.